Murata Cheerleaders display their coordinated moves at Ceatec Japan in Chiba on October 6, 2014. They're small, cute, packed with technology and likely to become one of the stars of this week's Ceatec electronics expo in Japan, where robots are always a hit. Murata's robot Cheerleading squad performed for the first time in public on Tuesday at the event, which is expected to draw tens of thousands to the Makuhari Messe exhibition center, just east of Tokyo. The robots were developed by Murata to demonstrate its sensor technology. 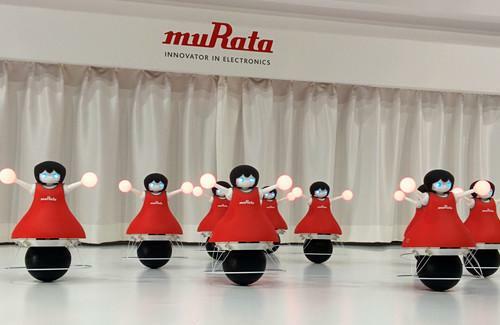 While its sensors are found in numerous products from much bigger brand names, Murata itself is far from a household name, but it has succeeded in drawing attention to itself through a series of robots that perform neat tricks while attracting TV cameras. First there was Murata Boy, a robot that pedaled a bicycle up and down slopes and around corners while keeping perfect balance. Then followed Murata Girl, a robot that did much the same but on only one wheel. The cheerleaders, which were first announced a couple of weeks ago, roll around the stage in formation while balanced on balls. Sensors help the robots keep balanced -- no small feat for a human or a machine -- and help them avoid collisions while they perform synchronized movements across a stage. Developed over the course of 18 months, they're still not perfect. During a presentation for reporters on Monday, a couple lost their balance and another couple bumped into each other. Still, that shouldn't stop the Ceatec crowds over the rest of the week.